The sting of unmet expectations have and continue to cause a labyrinth of inner and outer turmoil, furthering the cause of frustration, thoroughly illustrating what we all know as the human condition. It's with that idea in mind that I enter into this review about a wine, that for me, had built my expectations to a high and lofty place, but after uncorking the bottle, decanting, waiting, a swirl here, a slurp there, uggh, the big let down. 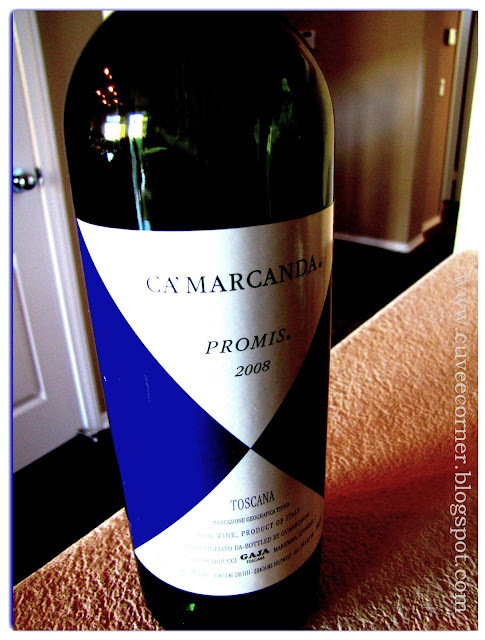 The 2006 was amazing in 2008, when I first encountered it in Italy and still amazing today. I'm so glad I still have a few of them left to savor, but the 2008 vintage, while as Mrs. Cuvee described it as "good", for me it lacked that "wow-factor". I'm all about two things as a self-proclaimed reviewer of wine; one is finding great wines for a reasonable price and the second is finding wines with what I call the "wow-factor". I say, "what I call", because I'm pretty sure I'm the one the few describing wines in that context. That said, the 2008 Ca' Marcanda did not live up to my expectations, I spent $35 on this wine and from past experiences I was really expecting so-much more, I was thinking, "hmmm, I'll grab a half case to cellar, if it turns out be the stellar juice it had been in the past. [I've sampled this wine twice, two bottle purchase, one six months ago and one recently]. But nope, I won't be going back to that well anytime soon, and to you wonderful folks that read my blog and take my recommendations to heart, this wine is one to skip, it's not worth the price of admission. I had a conversation with Mrs. Cuvee, about this wine that she proclaimed as "good" which for her is way above "okay", but I asked her the all important question, is it $35 good? She shrugged her shoulders, and gave no reply. See, I had my answer, yes it was good, but like I say it's not worth the price of admission, there was zero "wow" factor. And just incase you were wondering aloud, "would more time in the cellar help"? Sorry to say I don't believe so, time does not heal all things, it's what it's now, there's no room for improvement. By the way, someone should let the buyers office from Costco know, that the may just want to cut their losses on this wine, it does not appear to be selling as is, better to mark it down and move on, then let it continue take up valuable box-seat space. Okay so about the wine; a light colored ruby core shimmering nicely in the glass, dried plums, violet floral aromas and cherries. After the first splash down; a bowl of cherries, you’ll find this wine to be very soft, smattering of inexpressive flavors: dried blackberry and plum notes, a pleasant earthiness, red unsweetened licorice, vanilla, and a dusting of baker’s chocolate playing on the back porch, the tannins soft, supple and simple, the brisk finish has me wondering what happened? This is a good wine, one I wouldn’t mind buying again, but only for a much lower price, something like $11.99, but the current price tag will keep me away from this vintage. My score is at the very bottom of my very good scale; so it gets 85 points, nearly reaching toward "oh-no I think I lost your number territory, oh-my. If you are looking for a pairing recommendation; here’s a great recipe, which I found at Epicurious.com. It's one I’ve used before; Mozzarella-Stuffed Grilled Portobellos, you'll find that the earthy character of the wine, plays nicely with the rustic flavors of the [which I get from Sprouts] mushrooms; add a splash of balsamic vinegar for a touch of sweetness, give it a swirl.